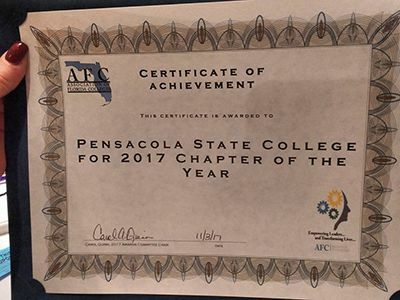 The Pensacola State College chapter of the Association of Florida Colleges was named the 2016-17 Chapter of the Year during the 2017 Annual Meeting and Conference held Nov. 1-3 in Palm Harbor. The Chapter of the Year award is presented based on documentation of functions and events from the 16 categories relating to the goals and mission of AFC. Pensacola State was chosen as the top chapter of the year out of 21 chapters which submitted an entry. 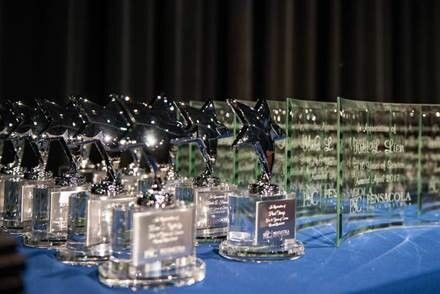 Pensacola State also earned a Platinum Chapter ranking ─ the highest ranking bestowed upon a chapter. 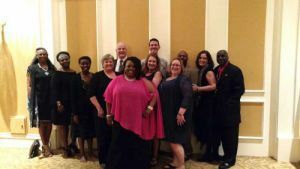 The chapter received a Membership Growth Award based on the membership increase May 2016-May 2017. Lanatta Barrett ─ Unsung Hero: Selected by the chapter president, the award is presented to a member who steps up to help, and/or makes contributions to chapter functions voluntarily and with appositive “can do/will do” attitude. Mel Miner – Lifesaver Award: Selected by the chapter president, the award is presented to a member who can always be counted upon to chair committees, handle major functions, or duties for the chapter. Carol Quinn received a Special Gift Recognition from the Region I Director-elect after Director-elect Mel Miner was asked to step in this conference as the actual director, she turned to Carol Quinn for guidance and help. Tammy Henderson received a Certificate of Appreciation from the Region I Director for assistance as a chapter president. Mishel Johnson was elected Historian to the Workforce, Adult and Continuing Education Commission. Mel Miner was elected Region I Director and will host the Region I conference in Pensacola in April 2018. Sheila Nichols served as chair to the Communications and Marketing Commission where she organized and oversaw the Leroy Collins Award and reception. Rob Gregg led the Pledge of Allegiance at the conference’s opening session. Carol Quinn was the Silent Auction chair; and was assisted by Diane Bracken. The auction raised $5,959. The chapter fundraiser ─ 50/50 draw ─ also generated $158 the Pensacola State’s chapter treasury. Throughout the conference, Pensacola State members assisted with assigned duties in the exhibit hall, took photographs, manned the chapter table, assisted in the silent auction area, made donations to the service project, and participated in the Friday morning Fun Run.